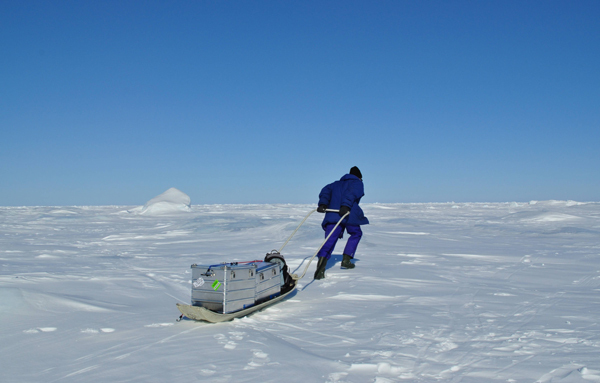 McGill professor Bruno Tremblay pulling a sled containing equipment to measure Arctic sea ice. McGill has a rich history of research excellence on a wide variety of topics related to the North. In an effort to build on this multi-facetted scientific expertise and provide a network for future research, in October 2014, McGill joined forces with Université Laval and the Institut national de recherche scientifique (INRS) to establish a Northern Institute, Institut Nordique du Québec (INQ). Simultaneously, the Minister of Energy and Natural Resources, Pierre Arcand, committed a budget envelope of $3 million over three years to support activities related to the establishment of INQ. Communicating with communities is vital to conducting research in the North. The founding partners are therefore currently laying the groundwork for the Institute in collaboration with representatives from northern communities who are interacting with academic researchers in setting the research agenda for the INQ. By bringing together these key stakeholders, INQ will be strongly mobilized to support decision makers with the scientific knowledge and technical expertise necessary for the sustainable development of Northern Quebec while respecting the interests of northern communities and their distinctive social, environmental and economic concerns. “The plan is for INQ to become a hub for research, innovation, and community development related to the North across disciplines, including in areas like the responsible use of natural resources, nutrition and health of Indigenous people, civic security in the Arctic, access to education, and renewable energy,” McGill’s Vice-Principal (Research and International Relations) Rosie Goldstein told The McGill Daily in October. Though the integrated university health network (Réseau Universitaire Intégré de Santé [RUIS]), McGill supports the training and development of healthcare professionals, including in the areas of research, teaching and technology evaluation in delivering health services in northern territories. McGill is also actively working with Inuit and Aboriginal peoples of the North, particularly in the field of education and vocational and technical training. Building on the strengths of the existing research centres, networks, and infrastructures, participation in INQ will provide an unprecedented opportunity for McGill faculty, students, and research professionals to connect to a national infrastructure for research in support of sustainability in northern regions. The INQ is in its inaugural phase and faculty and students with interest in the north are invited to participate in the next steps of the INQ and contribute to the discussions around programming and outreach activities. A discussion forum, open to all McGill faculty and students, will be held on Feb. 17. This session will provide an introduction to the INQ vision and plans and allow INQ organizers to hear from the community on McGill’s priorities related to northern research. It will also serve to map the strength and breadth of McGill-led research related to the north.